A very nice mix of funk and jazz samples and melodies with a twist of electronic msuic made with the dancefloor in mind. The opening track 'Two' is a clever number with its changes and sonic wizardry throughout. It will definitetly not bore you. It shows that making the perfect blend between house and techno dipped into one big pot of deep Detroit vibes is achievable and produces great results - when done right! 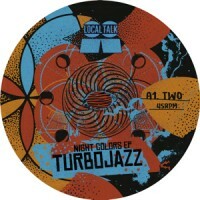 On the flipside we get 'The Joint', a track that wears the distinct Turbojazz trademark throughout with its playful keys and sequenced drum programming at full tilt. Perfect 12" for both the club and horizontal dancing. Sil says: Soul, jazz and funk blended together with a house and electronic twist. Remember Atjazz and some early Classic Music Company records? This one carries a certain aura that remind us of those years.